Baliton merges with Wilda during battles. Like Wilda, he is slow to move, but he uses his massive weight to crush his foe. His brown exterior is the perfect camouflage when battling in the desert. Horns cover his body from head to tail, and his multi-horned tail with sharp nails at the end can swing around like a baseball bat. 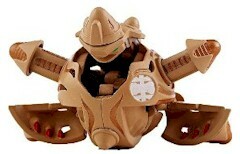 Purchase your Bakugan Baliton from Amazon now!